Adelaide Airport is an impressive facility, but I wish someone had reminded the architect who designed the place that passengers waiting for check-in to open might be there because they don’t have much choice in the matter and might appreciate something to sit on. 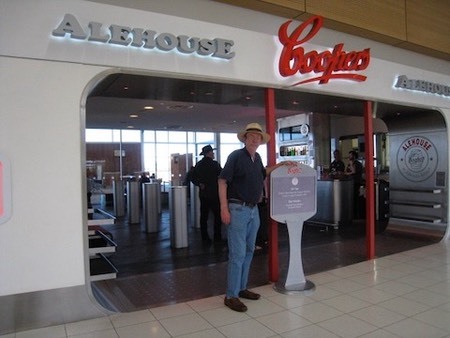 Once we’d separated ourselves from the luggage there wasn’t a great deal to do that didn’t involve enjoying the view across to the Adelaide Hills from the Coopers’ Ale House and a snack before the boarding call. Once aboard, I immersed myself in The Patience of the Spider and, some three hours later, back on terra firma once we’d reclaimed the belongings, it was time to see about a shuttle from the airport to the unit. It wasn’t the speediest of transfers, but once we were back where the Adelaide leg of the trip effectively started there wasn’t a great deal to do until the time came to resume the northward journey two days later.